ALIEN DREAMS depicts a naive immigrant of color on their way North, oblivious to the horrors they will face as so called extraterrestrials. Alien Dreams was performed on the Penn Station Bridge during Artscape Festival in July 2013 in Baltimore Maryland. This performance was a response to the national sentiment in the United States that perennially scapegoats non white immigrants coming into the United States and those who associate with them. By enacting draconian laws that dehumanize the immigrant of color and by reducing them to 'Aliens' or far worse 'Illegal Aliens' the privileged ruling class justifies the consumption, subjugation and exploitation of bodies of color. 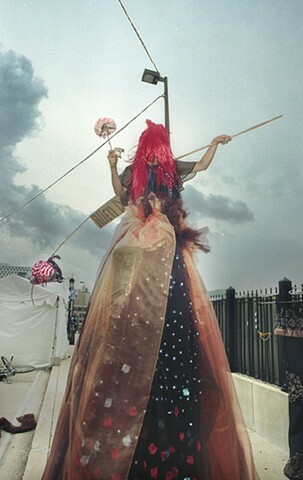 In ALIEN DREAMS, I wore a thick red wig and a black silk dress attached to an 8’ ladder. Over my left shoulder I carried an 8 foot bamboo bindle with a silk american flag scarf tied to the end of it along with a sign that read: ALIEN DREAMS. In my right hand I held an oversized silk flower. While on the ladder I rotated my torso back and forth for one consecutive hour creating the illusion that i was a tall rotating animated sculpture.